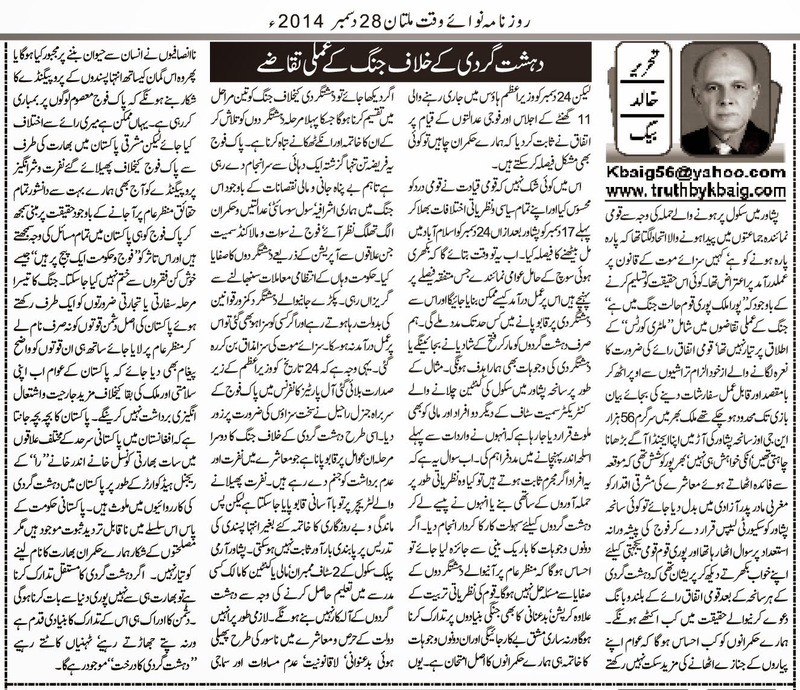 Truth by Kbaig: Practical Demands of War on Terror..! Practical Demands of War on Terror..! It seemed that the union of political parties that was formed after Peshawar school attack was about shatter; someone had objection law of death penalty, other was had objection over the establishment of Military Courts to punish terrorists despite of accepting the reality that country passing through a war like situation, those who proclaimed the slogan of need for national unity were not ready to go beyond the allegations and take meaningful practical steps. More than 56 thousand NGOs working in the country were to exploit Peshawar tragedy to further their mission of replacing Eastern Values with the Western Illicitness. 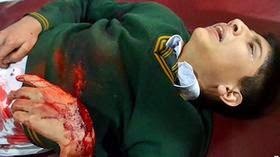 Few elements were exploiting the tragic incident to raise questions over the professional capability of Pak army by claiming terrorist attack as a Security Lapse. In such a situation nation was worried seeing its dream of national solidarity being shattered and worrying that when claimants of national solidarity would unite practically. Politicians would realize that public have no more patience left to see the funerals of their loved ones. The 11 hours long meeting of the political leaders in Prime Minister House Islamabad for establishment of Military Courts proved that our rulers can take any difficult decision if they are willing to do so. There is no doubt that national leadership realized the national pain and ignoring their mutual disputes gathered on 17 December 2014 in Peshawar and afterwards on 24 December 2014 in Islamabad. This would be decided by the time that how politicians having different political interests will implement their decisions against terrorism and how much this decision would help in eradication of terrorism. Whether we will celebrate our victory by killing terrorists or the root causes of terrorism would be our target as well? For example it is being alleged that canteen contractor of school in Peshawar along with two of his employees supported terrorists in transfer of weapons into school before the attack. The question is if these accused are proved to be guilty than why did they support terrorists; either for money or ideological leaning towards TTP. If we deeply in these root causes than we realize that only killing terrorists will not end terrorism in the motherland. Besides ideological training of the nation; eradication of corruption, bribery, misuse of powers etc. is also required to eradicate terrorism or all efforts would go in vain. The eradication of these two root causes is the actual test of our political leadership. In the light of the above we will have to divide the war against terrorism in three phases. First phase is the search and destruction of terrorists and their safe heavens. Pak army is fulfilling this duty for last one decade, however, despite of uncountable loss of lives our elite class, civil society, judiciary and politicians remained uninterested and indifferent in this war on terrorism. Including Swat and Malakand along with other areas from which army neutralized terrorists, civil govt. avoided to take control of civil administration. Arrested terrorists were released due to loop holes in the laws and those who were given death sentences were not executed. Death sentence became a joke. In the All Parties Conference called on 24 December 2014 by Prime Minister, Army Chief emphasized on the need for harsh capital punishments. The second Phase in war on terrorism would be controlling those elements and events that are spreading hatred and intolerance in the society. Literature containing such hatred material can be easily eradicated but without controlling unemployment and under development the efforts to control extremism would remain fruitless. 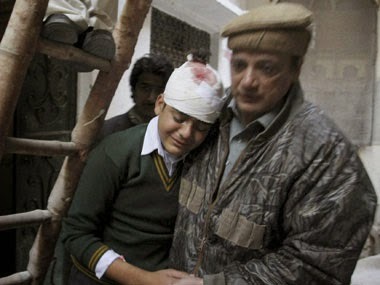 2 staff members of Peshawar School Cantene, owner of the canteen or gardener would not have become part of terrorist attack due to education of Madrissa but the increasing gulf between have and have nots, corruption, unemployment, lawlessness and social injustice would have forced them to join hands with terrorists or they might have been brain washed by this propaganda that Pak army is bombing innocents. One may differ with my opinion but this is the bitter reality that some intellectuals still take Indian propaganda over Eastern Pakistan against Pak army as true despite of disclosure of the facts and bitter realities. This biasedness of these elements against Pak army cannot be eradicated by the attracting slogans of “Army and Govt. are at the same page”.